Following its triumph at the recent National Recycling Awards, The Boss Design Group continues its winning streak as it celebrates achieving The Furniture Makers’ Company’s inaugural Export Award. This latest award is in recognition of the company’s outstanding efforts in developing business overseas. The award was presented at a special Export and Growth event organised by British Furniture Confederation at the House of Commons on Tuesday 11th October 2016. 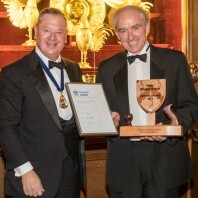 A second presentation took place at the Furniture Makers’ Royal Charter Dinner at Skinners’ Hall, London on Tuesday 25th October 2016, held to celebrate The Furniture Makers’ Company being incorporated by Royal Charter in 2013. Boss Design’s export activities were praised by the expert judging panel for having dramatically improved the company’s performance, growth, competitiveness, customer perception, and staff engagement. The Furniture Makers’ Company is the British furnishing industry’s charity and patron. The Export Award was launched in 2016 to recognise excellence in promoting and selling British manufactured furniture, bedding and furnishings to increase overseas markets.